Compost Tea? How About Compost Pee! My news tab in Firefox is the BBC “latest headlines” page. It’s a great place to get pretty darn unbiased news plus the U.K. equivalent of “News of the Weird”. SO, relative to our ongoing discussion of composting…here’s a story ripped directly from the BBC headlines. Follow the link for a video (interview, that is). Disclaimerage: I nor any of the other Garden Professors endorse this activity, nor any claims as to its usefulness, scientific relevancy, harrumph harrumph, etc,. etc,. etc. We do, however, fully endorse garden-related humor! Gardeners at a National Trust property in Cambridgeshire are urging people to relieve themselves outdoors to help gardens grow greener. A three-metre long “pee bale” has been installed at Wimpole Hall. Head gardener Philip Whaites is urging his male colleagues to pee on the straw bale to activate the composting process on the estate’s compost heap. He said the “pee bale” is only in use out of visitor hours, since “we don’t want to scare the public”. He said: “For eight weeks now, male members of our garden and estate teams have been using the outdoor straw bale when nature calls. The pee bale is excellent matter to add to our compost heap to stimulate the composting process; and with over 400 acres of gardens and parkland to utilise compost, we need all the help we can get. By the end of the year, it was calculated that the 10 men from the 70-strong garden and estates team will make more 1,000 individual trips to the pee bale, contributing towards the compost for the estate. The estate said it will have saved up to 30% of its daily water use by not having to flush the loo so many times. Rosemary Hooper, Wimpole estate’s in-house master composter, said: “Most people can compost in some way in their own gardens. Peeing on a compost heap activates the composting process, helps to produce a ready supply of lovely organic matter to add back to the garden. Posted on November 17, 2009 Author Holly ScogginsCategories Amusing Facts, Just do it, StoriesTags compost tea, home remedies6 Comments on Compost Tea? How About Compost Pee! “Dabney! No! Wait!” Just kidding. Dabney Blanton, our lovely and talented horticulturist, knows not to prune the Artemisia in the autumn. I imagine most gardeners have experienced a frost or freeze by now [exceptions: our Southern Hemisphere readers (howdy to Jimbo)…or anyone in the deeeeep south]. The perennials here in Blacksburg have taken a couple of hits; time to start trimming things back. In the Hahn Horticulture Garden and in my own personal garden, we like to leave perennials and ornamental grasses up as long as possible – gives us something to look at besides mulch, plus the wee birdies enjoy it. But some perennials just look yucky after a freeze. Case in point: foliage of the popular perennial Artemisia ‘Powis Castle’ resembles graying Kleenexes, hanging on the tips of the branches. HOWEVER, do not cut this back in the fall. It, like many other shrubby perennials, is sensitive to early winter whacking, in my experience, Buddleia and Caryopteris also fall into this category. Apparently the severe pruning sends a message to the plant to break bud – new shoots can appear and then “zap!” Wait until new buds appear in the spring, and be careful not to cut back too hard. I’ve killed a few that way, thinking I was doing them a favor. The best resource ever on maintaining perennials is Tracy DiSabato-Aust’s The Well-tended Perennial Garden. I should get kickbacks, as much as I’ve promoted this book! Truly a wealth of info – when should you cut it back, will it rebloom if deadheaded, don’t do [whatever] or you’ll kill it – all broken out by genus. Outstanding! Following up on Holly’s theme of “I can’t believe I get paid to do this”, last Wednesday I participated in a walk-through and inspection of the Justin ‘Chub’ Harper Collection of Dwarf and Rare conifers at MSU’s Hidden Lake Gardens in south central Michigan. 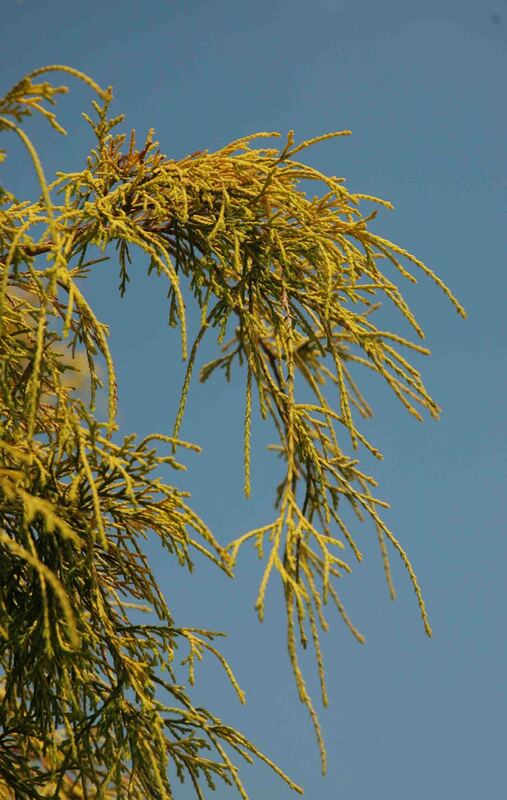 The Harper collection is widely regarded as one of the premier collections of rare and unusual conifers in the world. Harper Conifer Collection with fall color background. Photo: Jack Wikle. A little background: Chub Harper was the former grounds supervisor for John Deere’s world headquarters in Moline, IL, an avid plant collector, and a founding member of the American Conifer Society (ACS). He acquired hundreds of rare and unusual conifer specimens around his home and eventually had to lease a nearby lot for the overflow – demonstrating that ACS also stands for ‘Addicted Conifer Syndrome’. In the early 1980’s Chub donated 300 conifers to Hidden Lake Gardens to establish the Harper collection. All of the plants were balled and burlapped by hand and shipped in three semis to Michigan. Chub continued to add plants to the collection and today the collection includes over 500 accessions. I met Chub about 8 years ago and with his guidance and inspiration started a series of ‘Conifer Corner’ articles in the Michigan Nursery and Landscape Michigan Landscape magazine. (visit my faculty page for .pdf’s of some sample articles http://www.hrt.msu.edu/bert-cregg/pg5). Once or twice a year Chub would travel from Moline to Michigan to inspect the collection along with members of his conifer posse. To me, the most impressive thing about the walk-throughs was how absolutely ruthless Chub was in disposing of under-performing plants or plants with continual pest problems. “Time for that thing to take a ride on the chipper truck” was a favorite Chub-ism. Hidden Lake Gardens has a garden staff that could spray pesticides or prune away dead material regularly; but Chub wanted none of it. This is not to say that Chub was into organic gardening; as far as I know he had no particular aversion to chemicals. Rather, he felt the mission of the collection was education and that maintaining plants in an artificially superior condition would mislead the public into thinking some conifers were better suited than they actually were. The Conifer posse at the 2007 walk-through. Chub Harper is 3rd from left, back row. Chub passed away unexpectedly earlier this year and last Wednesday’s walk-through was the first evaluation of the collection without him. The conifer posse carried on, led by former ACS President Dennis Groh; Chub’s longtime friend Jack Wikle; and Sam Lovall, the landscape architect who developed the original design for the collection. We found homes in the collection for several new specimens including an Abies concolor ‘Charmin’ Chub’ and condemned a few underachievers to a ride on the chipper truck. Chub left many legacies; the most obvious and tangible is the Harper Collection and the staggering generosity it represents. Imagine dedicating half your life to acquiring and cultivating a world-class collection and then simply giving it away. Just as important, however, is the legacy he left with those who knew him, who felt his passion for conifers, and were inspired by him. As you can see, there’s a street light near the lower half of the maple. (I cleverly hid it behind the utility pole in the first photo.) The green part of the tree never received the message that days were getting shorter, since the street light is bright enough to interrupt the dark period necessary to initiate dormancy. This is one of my favorite phenomena unique to urban environments. It doesn’t appear to hurt the tree, although the green leaves will die before the tree can scavenge their nutrients. If more of the tree were affected, I’d be more concerned. Congratulations to Planting Oaks, who nailed this right off. And kudos to those thoughtful alternative explanations, all of which could logically have had an impact on color change. Posted on November 9, 2009 Author Linda Chalker-ScottCategories Amusing Facts, Diversions, What About the Trees1 Comment on I see the light! What do you think caused part of this tree to retain its green leaves? Answer and another photo on Monday! I just couldn’t resist posting this picture today. There are a bunch of garden gurus out there who claim that slugs won’t cross crushed eggshells. I, personally, have never seen a slug halted by them. I know a few folks out there are starting to believe that I’m just an apologist for the nursery industry. While it’s true most of the nursery people with whom I work are hard-working folks trying to do their best to run a successful business and produce a quality crop, there are certainly some issues out there and I’ve got my share of pet peeves. One of the things really that chafes my heiney is what I refer to as “Carrot-top” syndrome in eastern white pine (Pinus strobus). 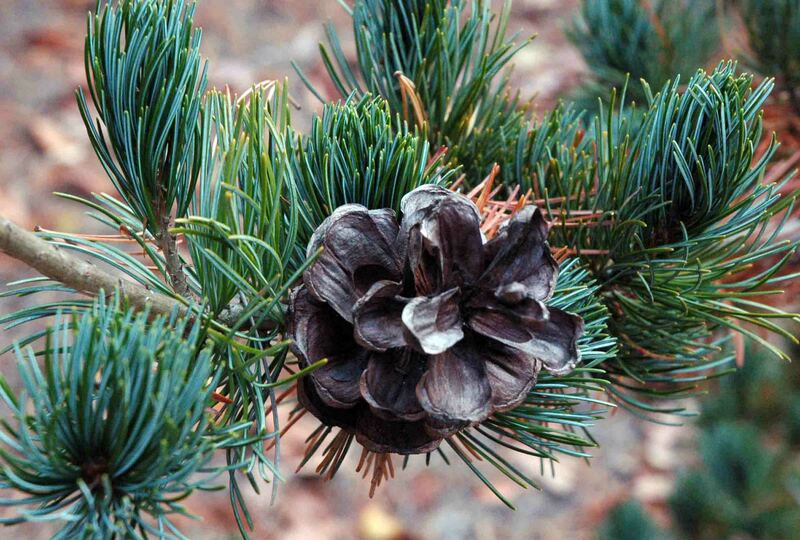 White pine is one of the most commonly planted conifers in this part of the world. White pine is native throughout much of the eastern US and is an extremely fast growing tree that makes a good ornamental when planted on the right place with room to grow. It is also widely grown as a Christmas tree in the Upper Midwest as well and therein lies the rub. Many nursery producers also grow Christmas trees and many Christmas tree growers also dig nursery stock. The result? White pines that have been heavily sheared as Christmas trees end up planted as landscape trees. Once in the landscape, the upper portions of the trees will quickly resume rapid growth, with some shoots growing 2’ to 3’ or more per year; while the side shoots that had been repeatedly sheared barely grow at all. After a couple of years the net result is neatly trimmed Christmas tree with a wooly beast growing out of its top. What’s the solution? Ideally producers should identify which portion of their trees will be sold as Christmas trees and which are destined for the landscape trade. Christmas trees can be sheared to meet demands of that market while landscape trees can be pruned much more lightly to maintain a single leader and conical form but keep obvious layers of whorls. The dilemma, of course, is that growers don’t always know which trees will end up and the Christmas tree lot and which will be dug for the nursery trade. The other, more challenging problem is that, given a choice, 99 out of 100 garden consumers will choose the neat-looking Christmas tree for the landscape, unaware of the wooly mess that’s about to be unleashed in their yard. The solution? Education on both sides; making growers aware of the issue and making consumers realize that the only way to have a natural-looking white pine in your yard is to start with a natural-looking white pine. Heavily sheared pines will retain the outline from from shearing for years while the top rages out of control. How on Earth Did I Land This Gig?! Linda referred to my recent absence from the blog – but it was in the name of education, I swear! Cocos nucifera, the iconic coconut palm. My office for the past two weeks. Or a Corona advertisement. You pick. This study abroad to the Dominican Republic sent Virginia Tech students (mostly biology and natural resources majors) to the Punta Cana Ecological Foundation for the entire semester, with faculty rotating in for two-week stints on topics from ornithology to geography. My topic was “tropical horticulture”. The professor previous to my session had to cancel his trip; by the time I arrived, the un-chaperoned students had basically gone feral. Corralling them with promises of beer and French fries, I coaxed them out onto plant i.d. walks. By the time our field trip to the national botanical garden rolled around, they were blurting out plant names left and right. Made me proud! Identification walk featuring salt-tolerant plants. That’s red mangrove, Rhizophore mangle, on the right. Feral students on left. The ecological foundation’s shade houses, orchard, and organic veg gardens grow some of the produce for the resort and made for a great learning experience (unusual greenhouse pest problem: tarantulas). I’ll post more tropical plant pics and factoids in January – when we’ll really, really need to see them. Morinda citrifolia, better known as Noni. Though chock full of vitamins and all manner of secondary metabolites of medicinal interest, the smell of ripe Noni is comparable to Limburger cheese left in the sun for several days. Shrieks of “NONI!! !” meant someone was about to get pelted with over-ripe fruit. Posted on November 3, 2009 Author Holly ScogginsCategories Amusing Facts, Diversions, Interesting Plants9 Comments on How on Earth Did I Land This Gig?! We’ve recently added a 1-acre meadow to our on-campus teaching and display garden (the Hahn Horticulture Garden at Virginia Tech). Native trees, shrubs, perennials,and grasses surround a central lawn of buffalo grass. As one of the components of tall- and short-grass prairie, it is a popular forage in the west and midwest. Toughness and no-mow-ability makes buffalo grass a candidate for the low-maintenance lawn. We chose the cultivar ‘Bowie’, which has been reported as a good choice for the Mid-Atlantic…more cold and moisture tolerant. But it’s not cheap – ran us $15/lb with a seeding rate of 3lbs/1000 sq ft. We ordered 1/4 acre’s worth. Our horticulturist Paul calibrated the spreader not once but three times, and was still nervous. We’re pretty happy with the progress – it’s filling in nicely after 18 months. Once established, buffalo grass will pretty much choke everything else out, but until then, broadleaf weeds and crabgrass are a bit of a pain. Extremely drought resistant, it also handled this year’s surplus rainfall with no problems. The best way I can describe it is, er, cute! It’s so fluffy, and forms pet-able 6″ tall tussocks with little seed heads dancing about. One just might, after a hard day of academia-induced anxiety, want to lay down in it and make a “grass angel”. We’ve already had a light frost, hence the tawny color. This presents a teaching opportunity: most of the turf around here is tall fescue or blue grass – fairly evergreen, cool-season grasses. Buffalo grass WILL turn golden-brown in winter, and we’ll get lots of questions as to whether or not our meadow is “dead”. No, it’s just resting!